Once upon a time in a student dorm..
Another morning that Susan wakes up…. well, not in the morning, it’s already two in the afternoon. She is craving for some brunch after a crazy party night. She then realizes that the night was crazier than she initially thought since she is not even in her own dorm. Apparently the day hasn’t started very well and her stomach ache is still there. While she is searching for something edible, she stumbled upon a beautifully shaped bowl, oddly enough, full of uncooked noodles. Her first thought was what kind of freak is living in the dorm (not really, she was actually questioning what the raw noodles were doing in the bowl). Suddenly the door opened and fortunately it was her cousin Christy. It totally slipped Susan’s mind that they got to Christy’s dorm after those last delicious cocktails at Don’s. The dots were finally connected. But what about this bowl? Christy started explaining that this bowl was everything a student (and not only) wants. Since she got it, she doesn’t eat anything else besides noodles. 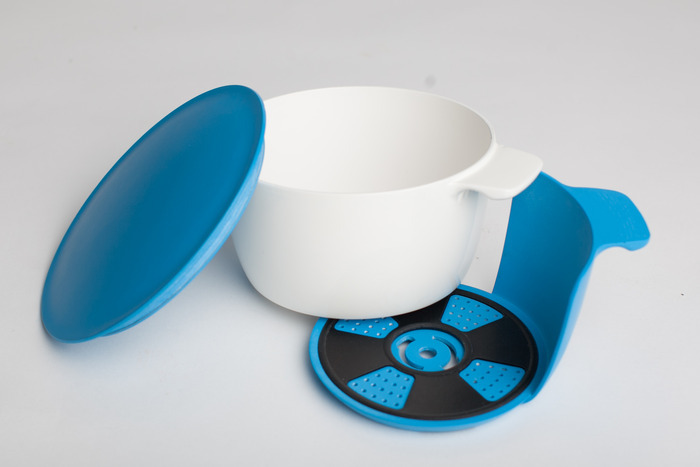 It’s the easiest and least messy way to prepare your favourite meal due to its extremely functional design. What are you talking about? It’s just a bowl.. The OneBowl is really nothing close to what you are used to. It’s a kickstarter project for a small 6″ diameter bowl both microwave and dishwasher safe, with a built-in strainer and a snap-on lid. It is the only bowl you will need to prepare, eat, take away and store your precious noodles. You place your noodles in the bowl together with water. Once cooked, you strain the water with the built in strainer at the bottom of the bowl so you do not burn yourself and you are ready to eat. Finished eating? Save the leftovers for tomorrow with the snap on lid. Don’t want to eat it anymore? Throw them away and place it in the dishwasher. Easy Peasy. The OneBowl will be ready for launch in Fall 2014 with first orders in October 2014, priced at $20. You can back the project by visiting the relevant page on kickstarter. Eating noodles has just become easier. Much easier.